I really love egg tarts. It's hard not to. 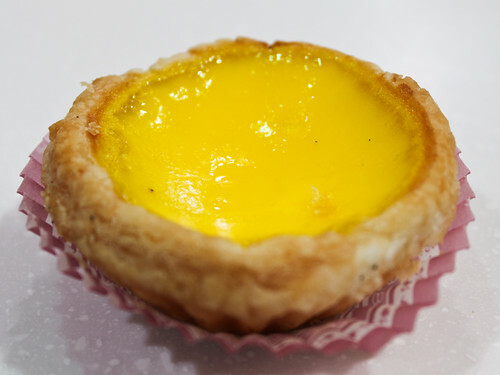 Going to Hong Kong is like traveling to Mecca, except instead of religious stuff, you get egg custard based pastries. In an effort to see if the reputation was well deserved, I made it a point to try an egg tart from 蛋塔王 or 'Egg Tart King.' Well, I did try, and I walked around like a moron in blazing heat and humidity only to get more and more annoyed. I finally gave up. No egg tart, no matter how good, was worth this kind of idiotic effort (blasphemy... I know). Determined to stuff something egg based in my mouth, I settled for the generic egg tart you see above. Sadness... and failure too. Except not really. The egg tarts I bought were 2 for 5 HKD (that's like 25 cents per if you're converting). Whilst I obviously can't compare them to the mythical creations of 'Egg Tart King,' these were splendid in their own right. Flaky and light on the first layer, buttery and rich throughout the remainder of the shell, and finished with a custard that still jiggled if you poked at it, this thing was... magical. When I realized that I only paid a quarter for this miniature replica of heaven, thoughts began rushing through my head of how many I could logically fit in a carry-on suitcase (trick question. If you're thinking 'practically,' the answer is actually 0). My conclusion? Don't bother looking for a specific place that sells egg tarts. I'm pretty sure there's a bunch of random places that do a damn good job. Then again... I'll forever wonder if that place really is that good. That looks delightful. The trick to the best egg tarts, in my humble experience, has been 1) enough salt and 2) very, very hot, and a bit caramelized. Why are you in HK?? Anyway, jealous! Long story short, I'm an idiot and was going to overstay my Taiwanese visa... so I went to HK to reset it for an additional 60 days. mm, i had some amazing egg tarts in HK, but i couldn't remember where to go back if i tried. when in taipei, you can try the egg tarts at Parents Restaurant. they are tiny but so good! I just discovered your blog and it's tormenting me at work with delicious memories of Taipei! Next time you're in HK and have a craving for egg tarts, you should go to the venerable Tai Cheong Bakery (泰昌餅家) on Lyndhurst Terrace in Central. Their egg tarts manage to exceed their (considerable) hype! chibiume - CRAP... I probably won't be back in HK for a lonnnng time. If even the average egg tarts are this good, then those must be phenomenal! As for the Taipei thing... imagine how I feel, I write about this stuff months after leaving. Every single post is like a knife in my heart haha. They were truly delightful, even in 95% humidity in the middle of August; my coworkers and I scarfed down an entire box and then some. Now I'm stuck trying to find a reasonable facsimile in SF!